1. Paid the salaries payable from 2015. 2. On March 1, 2016, Palicio established a $100 petty cash fund to handle small expenditures. 3. Paid $4,800 on May 1, 2016, for one year's lease on the company van in advance. 4. Paid $7,200 on May 2,2016 for one year's office rent in advance. 5. Purchased $400 of supplies on account. 6. Purchased 100 alarm systems for $28,000 cash during the year. 7. Sold 102 alarm systems for $57,120. All sales were on account. 8. Paid $2,100 on accounts payable during the year. 9. Replenished the petty cash fund on August 1. At this time, the petty cash fund had only $7 of currency left. It contained the following receipts: office supplies expense $23, cutting grass $55, and miscellaneous $14. 10. Billed $52,000 of monitoring services for the year. 11. 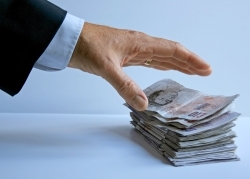 Paid installers and other employees a total of $25,000 cash for salaries. 12. Collected $89,300 of accounts receivable during the year. 13. Paid $3,600 of advertising expense during the year. 14. Paid $2,500 of utilities expense for the year. 15. Paid a dividend of $10,000 to the shareholders. 1. 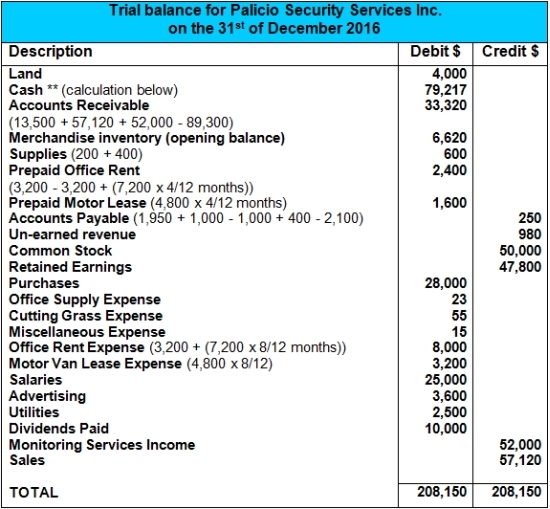 Prepare the trial balance as at Dec 31, 2016 for Palicio Security Services Inc.
2. 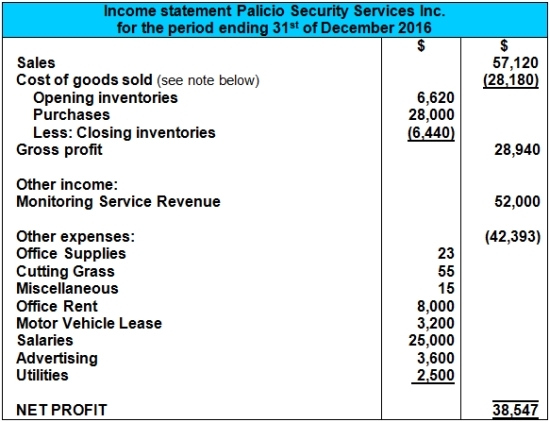 Prepare the income statement, statement of changes in equity and balance sheet for Palicio Security Services Inc. Inventory (including the FIFO Method and Cost of Goods Sold). Additionally, this question also deals with prepaid expenses and income received in advance , which are concepts I don’t go into detail about on this website (I only cover these topics in detail in my basic accounting books ). Here are some brief explanations though: Prepaid expenses are expenses you paid too early. Because it is paid too early it is as if you are owed the amount you paid, and the prepaid expense essentially is a debtor/receivable (an asset account). In a similar way, income earned in advance means you have been paid money before delivering the services/products, and so it is as if you owe this amount. Thus, income earned in advance is a creditor/payable . Note also that in this exercise we are dealing with a company or corporation , not a simple sole proprietor. With a corporation there are some new terms and concepts. First of all there are many owners in a corporation and these owners are called shareholders . 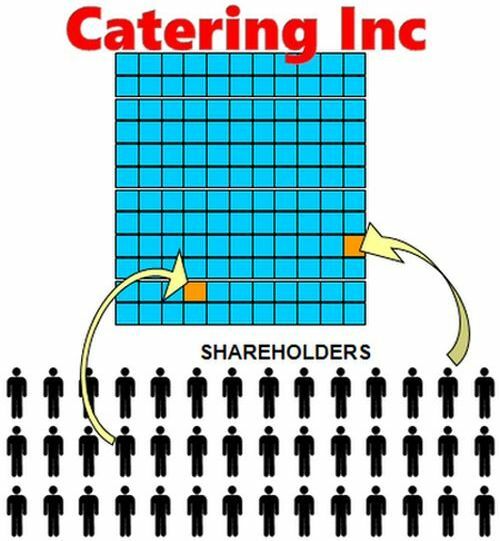 Also, each of the shareholders owns shares in the corporation, which is also known as common stock . Finally, instead of “drawings," we have dividends that are paid to all the shareholders from the accumulated profits (AKA retained earnings ). The opening balance of prepaid rent ($3,200) has been expensed out during 2016 as we have assumed this rent (that was paid the previous year) applies to the 2016 year. This is a likely assumption as there was a new prepaid rent cash payment on 2 May, 2016. It is not stated in the question whether the unearned revenue of $980 at the beginning of 2016 was actually earned during the year. In this solution we have assumed that the unearned revenue still remains unearned at the end of 2016. However, it is quite acceptable to treat this as having been earned during 2016. If treating it as earned during 2016 one would add $980 to revenue and remove the unearned revenue account ($980 - $980). Note that the prepayments (prepaid office rent and prepaid motor lease) have been included under debtors/receivables. Likewise, the income received in advance (“unearned revenue" of $980) has been included under creditors/payables. 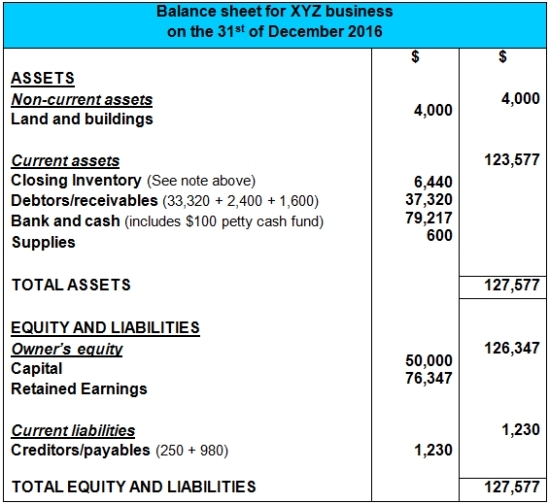 Hope you enjoyed this and got some good practice with the Company Trial Balance and Financial Statements Question! For more free exercises return to the Full Accounting Questions and Answers page. And for exercises you can do at home get one of our official books: Accounting Basics: Workbook or Accounting Basics: Complete Guide! As a learner I'm very pleased. I wish I should always have such presentation in the learning environment in which I am in order to fully master the Accounting profession. You can tell your teachers and administrators that you want better teaching with clear presentations. They can always make use of my accounting books at the school or college - they can be ordered through Amazon or local bookstores. This is a brilliant piece of example. However, shouldn't Accounts receivable of 33,320 be included as a credit entry? I AM very happy for helping me now understand trial balance and financial statements. I am very sure of excelling so as to fit well in accounting profession. Thank you. Tks very much. only one question, you use the formal format for the statements? Yes, use the more formal format if you can in tests/exams and definitely if practicing as an accountant. This site is very helpful for the accounting students like me. And at last i got the solution from your site. I have felt it very useful to me. You have helped me a lot to understand more about balance and financial statements. I am sure that this post will be very helpful for many people like me. Keep sharing such posts! Nice Post Thanks for sharing the blogs with us. 10. Billed $52,000 of monitoring services for the year. how do you journal this? 3. Paid $4,800 on May 1, 2016, for one year's lease on the company van in advance. How do I journalize this?